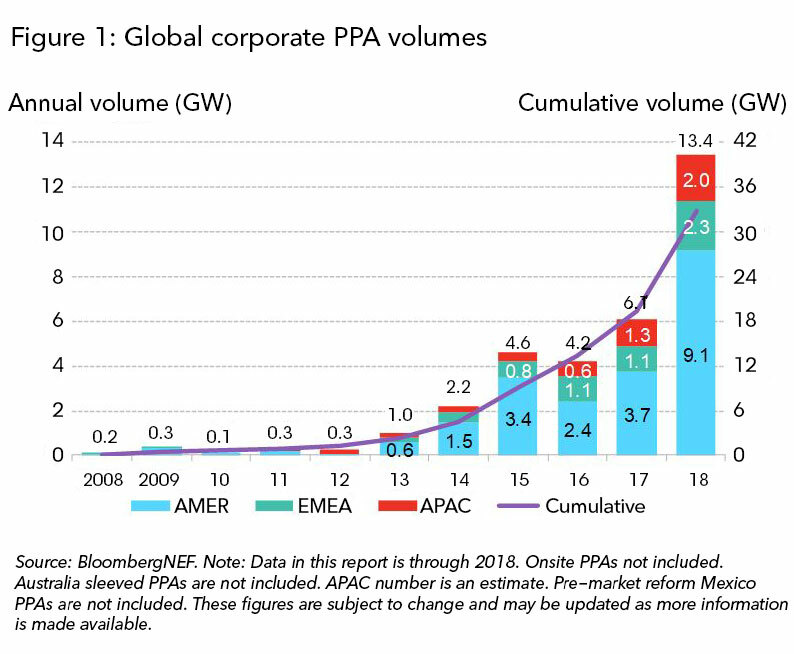 New York and London, January 29, 2018 – Corporations bought a record amount of clean energy through power purchase agreements, or PPAs, in 2018, shattering the previous record set in 2017. Highlights included a wave of smaller corporate energy buyers aggregating their purchases, and the first corporate clean energy power purchase agreements in markets such as Poland. In the U.S. a major feature was the emergence of smaller, first-time corporate clean energy buyers. In 2018, some 34 new companies signed their first clean energy PPAs, making up 31% of total activity in the U.S. These firms are aggregating their electricity demand to reap the economies of scale from larger solar and wind projects. In many cases, they benefit from partnering with a bigger, more experienced buyer – known as an anchor tenant – who can offer a stronger balance sheet and expertise on accounting and legal nuances when signing a PPA. Demand still far outstrips supply in the rest of APAC, although recent changes in several markets suggests a major spike in activity is on the horizon. Offsite corporate PPA mechanisms are now available in nine provinces in China, and the imminent passing of a renewable portfolio standard will give over 30,000 large commercial and industrial companies renewable electricity targets. In Japan, the country’s third non-fossil certificate auction saw corporations purchase 21TWh, tripling the combined activity in the first two auctions. Thirteen companies in Japan have also established 100 renewable electricity targets, more than the rest of APAC combined. The healthiest signal of continued growth in the global corporate procurement space is the growing alliance of companies establishing clean energy and sustainability commitments. 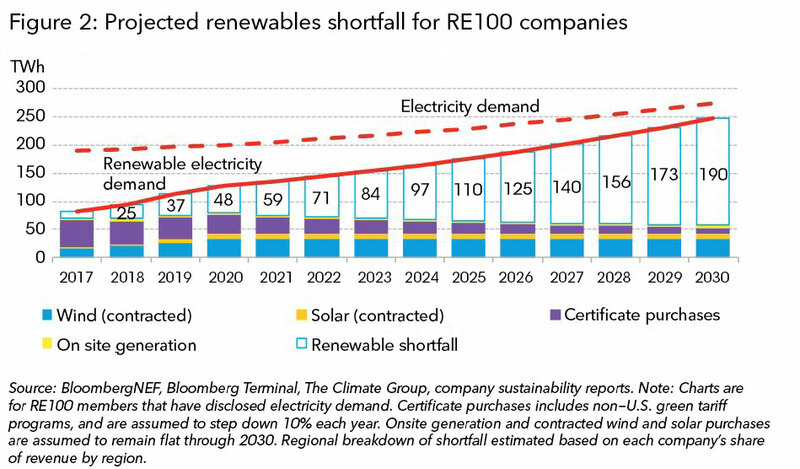 One such campaign, known as the RE100 – consisting of nearly 160 signatories at the end of 2018 that have established 100% renewable electricity targets – has companies domiciled in 23 different markets. Cumulatively, these companies consumed an estimated 189TWh of electricity in 2017, equivalent to Egypt’s electricity consumption. BNEF estimates these companies will need to purchase an additional 190TWh of clean electricity in 2030 to meet their RE100 targets. Should this shortfall be met with offsite solar and wind PPAs, it would catalyse an estimated 102GW of new solar and wind build globally, greater than the size of the U.K.’s power generation fleet in 2017 (see Figure 2 below).